The Charmouth Traders Association and the Charmouth Heritage Centre run their own independent websites. Rather than compete for the same web traffic the two sites use a common domain name with a single home page. SGSS were asked to redesign this home page to make it more appealing to tourists looking to visit the village. Some interesting images to showcase the area and attractions are used to set the scene. The iconic beach huts from Charmouth beach are used as graphics to highlight the main attractions of Beach, Heritage, Eat/Drink, Stay and Shop. 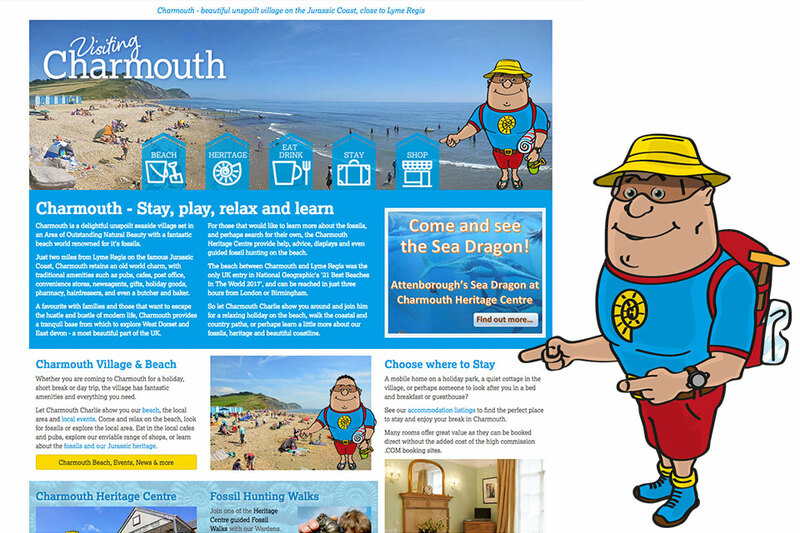 As an additional dimension to the site a character, call Charmouth Charlie, was produced. The character, designed as a holiday making superhero, is used to highlight certain elements on the page. The character is also intended for use by attractions in Charmouth to use as a promotional aid on their own marketing material.